We sometimes have a litter available, most of our puppies are reserved before the puppies are even born, so it is best to get into contact with us and we can see if we can help you. We ONLY have Dalmatians, we do not have lots of different breeds, we specialise only in Dallies, it should also be noted that we do not breed for commercialism, we have had a total of 35 puppies as at the end of 2012 as we firmly believe in Quality not quantity. Occassionally, puppies may be available that have been sired by one of our dogs, the puppies will be with their mother, so again, it is wise to contact us first. Any puppies that are Candidals or have been sired by a Candidals dog, will be BAER hearing tested, KC Registered, and have had the very best start in life, in return we are very choosey and you will be asked searching questions! Contact Candy Rose on Tel: 01728 861181 or Mobile: 07949 388416. 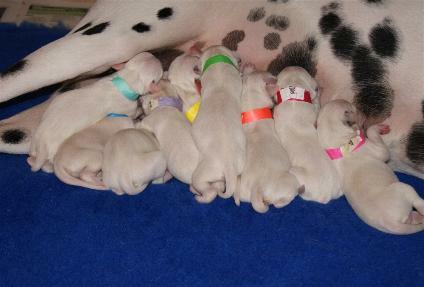 We are proud to announce that we have a litter planned for 2013, we will be repeating the matting between Frankie and Paris. (Candidals Flirty Frankie and Ch.Washakie Nutcracker Prince JW). Frankie is due in season May/June so puppies will be summer babies. So, what do you need to do to be considered for one of these puppies, the first thing is to get in contact with Candy for a discussion and we can take it from there. Normally, a Candidals Litter will be fully reserved in advance before they are even born and reservations for this litter are being taken already. Please contact Candy on 01728 861181.